Waste grease can take one of three routes out of a commercial kitchen. Cooking can be a greasy business. Whether you run a fast-food joint with to-die-for French fries or an upscale restaurant known for grilling up succulent steaks, you’re going to produce a certain amount of waste grease as you work. So where does all this grease go, and what problems can it pose? Read on to find out. The first place that grease goes during cooking is up in the air. 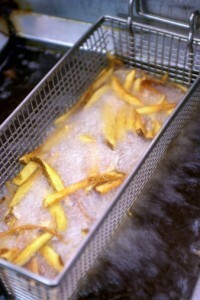 As food is cooked, a certain amount of the grease released from the food or the oil it’s cooking in becomes vaporized. In a properly designed commercial kitchen, the greasy air will automatically get sucked up into the exhaust hood. Some of the grease will accumulate on the hood itself and on the grease filter as the air passes through, but not all of it. Any grease that escapes the filter will end up inside the kitchen exhaust ducts. This presents a major issue because these grease deposits are highly flammable. Fortunately, you can turn to Flue Steam for all the kitchen exhaust cleaning services you may need. We offer hand scraping to keep exhaust hood grease under control, grease filter exchange service to make it easy to enjoy clean filters, and steam cleaning to remove grease from deep inside the ductwork. Grease that doesn’t get hot enough to vaporize can end up getting washed down the drain when the kitchen crew does the dishes. This also presents a serious problem, both for the restaurant and for the community, because the grease can clog pipes as well as damage water treatment equipment. For example, in Perryville MO officials found thousands of pounds of solidified grease in the water system. After working with local commercial kitchens to install grease traps and make other policy changes to keep grease from escaping into the sewer system, city officials report that this problem has decreased significantly. They estimate that $25,000 worth of repairs have been prevented in this first year of the program’s implementation. The last way that grease leaves a commercial kitchen is as part of a recycling program. Many different organizations now offer collection services, often for free. The waste grease can be used for a variety of purposes including as biodiesel for powering vehicles.